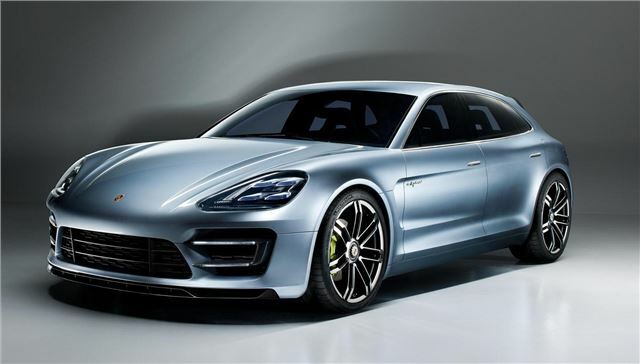 Porsche has shown the Panamera Sport Turismo, a larger ‘Shooting Brake’ style version of its large executive model. It’s a concept, but it could go into production in the future against the likes of the Audi A7 and Mercedes-Benz CLS Shooting Brake. While the car is still very recognisably a Panamera, it features a longer cabin, providing a larger rear load area and more rear headroom. The concept is painted in a metallic blue to accentuate the lines, like the bonnet bulges. The headlights dominate the front end design – they’re all-LED, as are the tail lights. Power comes from a plug-in hybrid system, combining a 95PS electric motor with a 333PS 3.0 V6 petrol engine. As you’d expect, performance is impressive – 0-62mph takes fewer than six seconds. Max speed in pure electric mode is 80mph, but the full top speed is yet to be announced. More importantly, that performance is accompanied by fuel economy of 80mpg and emissions of 82g/km on the combined cycle. Because the system is plug-in hybrid it can be charged from the mains, which takes up to 2.5 hours. There are several driving modes, including an all-electric mode with a range of 30km for proposed zero-emissions areas and there’s a mode that combines the full performance of both electric drive and petrol power. The cabin features a large central display in place of a traditional instrument cluster, on which various information can be pulled up by the driver. There are also displays in place of wing mirrors, one for each side of the car.